Combrink's Pass and the Holgat Pass are the descent and ascent respectively of the high plateau where the Bergplaas camping sites are found. Regardless of which direction you drive the pass, it is a visual feast. It is also the biggest of the five Baviaanskloof passes (Nuwekloof, Grasnek, Langkop, Holgat and Combrinks) in terms of altitude gain/loss. This is the last pass you will encounter before exiting the bio-reserve and entering the Cambria valley. Compressed within its 5,5 km length the road descends 333m via 73 bends, corners and curves, resulting in an average gradient of 1:16, but there are some sections as steep as 1:8. The road is single width for most of its length making overtaking impossible and passing difficult, where one of the vehicles will need to reverse back to a wider point. This pass is a winner with stunning views for its entire length, however for anyone suffering from acrophobia, the very steep and completely unguarded drop-offs could be quite intimidating. If you are new to the Baviaanskloof, we recommend watching the Orientation Overview video first. 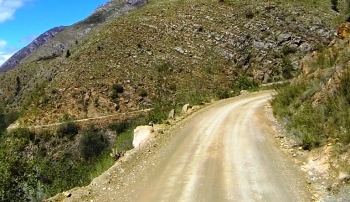 The Baviaanskloof has 8 magnificent passes and poorts of which the Grasnek Pass is probably the best in terms of scenic beauty. It’s fairly long at 8,3 km and includes in that length an astonishing 83 bends, corners and curves which equates to one bend every 100 metres. The pass is well designed (especially considering its age) and offers a fairly reasonable average gradient of 1:11 both ascending and descending. It rises from 247m to 447m ASL on it's western ascent of 3,7 km giving rise to some stiff gradients as steep as 1:6. Views from the ridge and summit zone are beyond description. We recommend a 4DW vehicle for this pass. If you are new to the Baviaanskloof, we recommend first watching the Orientation & Overview video. 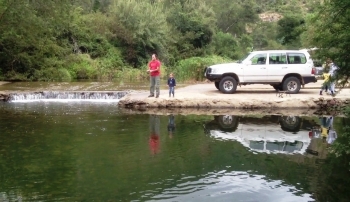 The Uniondale Poort was completely rebuilt over a lengthy period after being seriously damaged by floods about a decade ago. 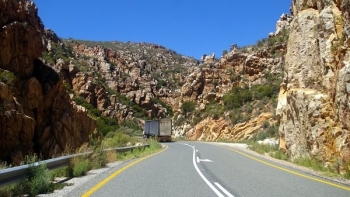 Today one can enjoy this lovely scenic drive through the poort on a beautifully engineered, modern road taking in the stunning rock formations and some small waterfalls if you are lucky enough to drive it after or during good rains. The road was first built through the poort in 1925 and it was tarred in 1960. It carries a secondary name of 'Queen Street'. The major, modern reconstruction took place between 2007 and 2010 during which phase traffic was routed to Uniondale via the Potjiesberg Pass on the N9. 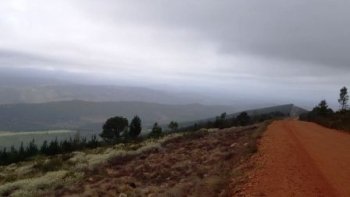 The Prince Alfred's Pass on the R339 gravel road between Knysna and Uniondale is probably Thomas Bain's greatest work. Not only was this an extremely long pass, but it also presented almost every possible technical obstacle to the pass-builders. Due to the length of the pass, we have filmed this pass in a 14 part series, which includes a separate 2 part video set covering the detour up to the Spitskop viewsite. 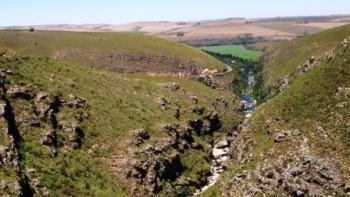 At 68,5 km it is the longest (publicly accessible) mountain pass in South Africa by a considerable margin, as well as being the second oldest unaltered pass still in use. The video footage covers the entire pass starting at Avontuur and ending at the at the junction with the N2 just east of Knysna. We recommend watching the series of videos sequentially to gain a complete picture of all this wonderful pass has to offer. All 14 videos follow below and are placed in the correct sequence amongst the relevant text section. The pass is Thomas Bain's Opus Magnum - a work of monumental proportions carried out with rudimentary equipment and convict labour, but with science, ingenuity and Bain's "can do" attitude making it all possible. Bain constructed 29 passes mainly in the Cape colony in his lifetime. This pass epitomises all of his unique touches, but especially his exceptional dry walling method of construction. Allow 1 hour and 15 minutes to watch the full video set and longer if you also want to study the text. Once digested you will be well equipped to deal with the rigours of the pass and the knowledge gained will greatly enhance your journey. 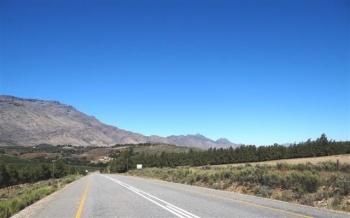 The Op de Tradouw Pass lies on the popular R62 route between Montagu and Barrydale - both towns which attract tourists by the droves and each has it's own special mystique and charm. This pass should not be confused with the Thomas Bain designed Tradouw Pass, which lies another 10 kms to the east and further to the south of Barrydale. 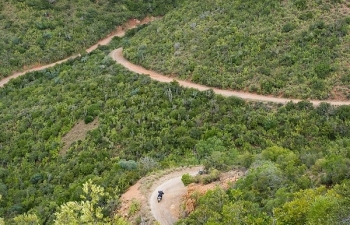 The Wildehondskloofhoogte Pass runs back to back with this pass and together the two passes form one long pass of over 15 km. The Op de Tradouw Pass has an altitude variance of 300m with an average gradient of 1:18 with the steepest parts reaching 1:15. It provides beautiful views of the Tradouw Valley peppered with fruit orchards and dams, with the Langeberg mountains in the background. The pass is modern, well engineered and safe, providing the speed limits and barrier lines are adhered to. This pass holds at least one South African pass record - it has the longest name, with 21 letters! 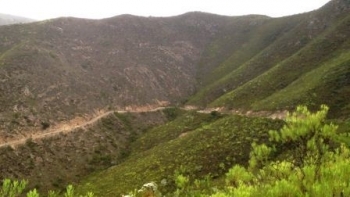 The name translates from Afrikaans into "Wild Dogs Ravine Heights" It can be found in the Langeberg mountains on the R62 between Montagu and Barrydale and precedes the Op de Tradouw Pass on its western side. The two passes form one long continuous pass. The road ascends the southern side of a ravine formed by the Goedgeloofrivier. It's a long pass at 11,2 km and although the average gradient is a mild 1:37, the steep sections are quite long and sustain some stiff gradients at around 1:10. 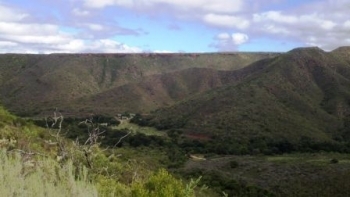 The Paardekop Pass delves a long way back into history and is recorded as far back as 1772 by the explorer, Thunberg in his journal. The original route was an elephant path which was later to become a bridle path, followed by the inevitable need for an ox-wagon route. It was considered to be one of the most dangerous passes in the colony in its day.